If you have always dreamed of being a prince or princess for the day turn your fantasy into reality by holding your wedding at castle. Castles in south east England, especially Kent, are many and varied, ranging from historic fortifications to more modern follies. From a photographer’s perspective they make fantastic wedding venues as they offer a wealth of interesting angles and backdrops. Here is my pick of some of the best castle wedding venues in the south east. If you want history, Hever Castle has more than seven centuries of it. 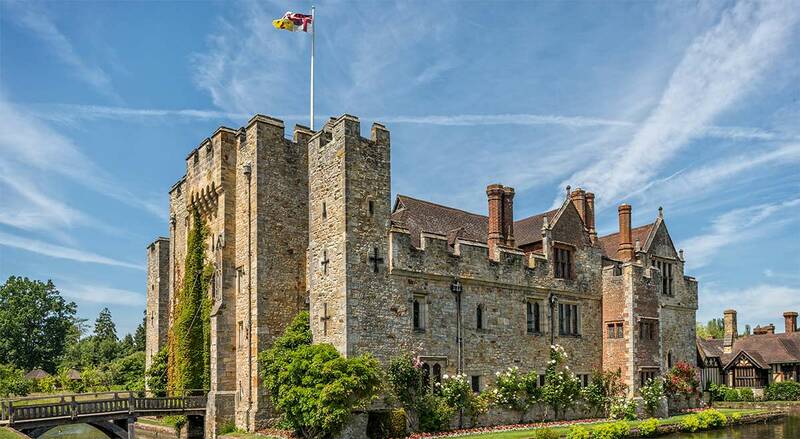 Best known for being the childhood home of ill-fated Anne Boleyn, second wife of Henry VIII (who not only had Anne beheaded, he gave the castle to his fourth wife when their marriage ended!) Hever is perfect for weddings with extensive grounds that include manicured gardens, a lake, and a 100 year old yew maze. The award winning venue has a variety of spaces to suit the size and atmosphere of your wedding. On the border between Kent and East Sussex, Wadhurst Castle is a picturesque spot to start married life. Rather than being a defensive battlement, Wadhurst is a luxurious mansion built in 1818, and extended in 1838. Wadhurst’s primary intention was to flaunt wealth and impress guests, which it does both indoors and out. Despite its grand appearance Wadhurst Castle has a warm, country house feel with beautiful gardens and lovely interior rooms perfect for entertaining. With the South Downs on the doorstep, Amberley Castle is one of West Sussex’s best located country wedding venues. The castle dates back to 1103 and is full of character, including one of just four working portcullis in the UK. The extensive gardens are beautifully maintained to provide not only somewhere for your guests to enjoy pre-wedding drinks, but to give a stunning setting for your wedding photos. The castle is also a luxurious hotel which you can hire exclusively for your wedding to make it perfect for hosting out of town guests. Hertford Castle is an impressive Hertfordshire wedding venue that will leave your guests talking about your big day for years to come. The site is the childhood home of Elizabeth I and while the original castle has gone, the gatehouse, which was extensively remodelled in the late 1700s, is a wonderful venue offering a choice of six different locations for your wedding ceremony, including incredibly pretty gardens. Berkshire never had much need for defensive castles but the crenelated walls of Castle Barn at Wasing Park, which was built in the 18th Century, is a good substitute. It is part of the Wasing Estate which has been hosting revellers who come to appreciate the beautiful Berkshire countryside for hundreds of years. The venue is extremely comfortable with brick walls being complemented inside by contemporary furnishings, and outside by a secret garden and lovely grounds. As with neighbouring Berkshire, Oxfordshire is not known for its castles, however Blenheim Palace more than makes up for it! This stunning estate is rich in history and is home to the Dukes of Marlborough. The only non-royal palace in Britain, it is one of the country’s biggest houses and has been designated a UNESCO World Heritage site. Thanks to its size it can accommodate weddings grand and intimate, with a ceremony room large enough for 250 guests. As you would expect from a venue of this calibre, the interiors will make your guests jaws drop with admiration. The magnificent gothic features of Strawberry Hill House make it the most photogenic wedding venue in Twickenham. Its decorative white walls and gothic revival style battlements are reminiscent of a wedding cake, and the richly decorated interiors give the impression of being on a stage. It is a wonderful year-round venue thanks to its sumptuous decor and gorgeous gardens.